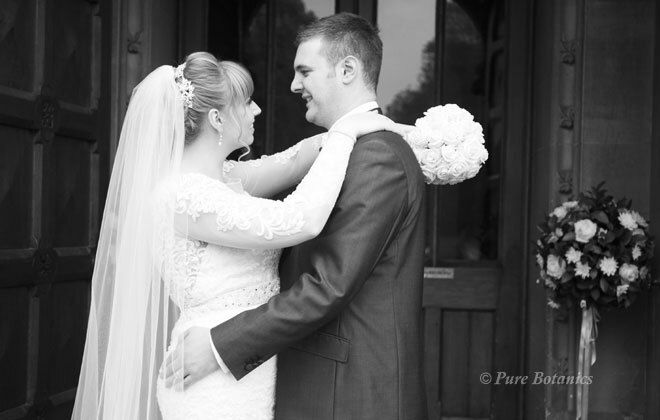 Rebecca added a real touch of sparkle to her wedding to Craig at Walton Hall. 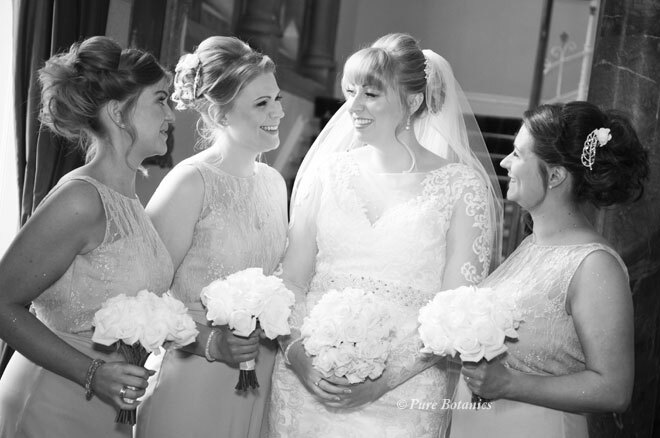 The flower choice was simply elegant and sophisticated using beautiful roses for all the bridal bouquets and buttonholes. 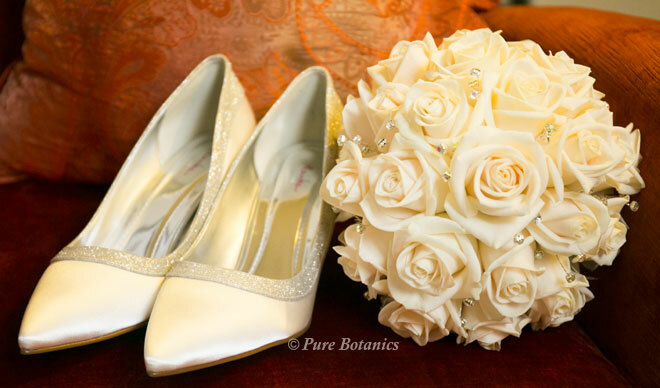 The bridal bouquet that you can see here is a perfect sphere of ivory roses with delicate diamante clusters tucked in-between them. This is one of the more difficult bouquets to create as the roses have to sit tightly next to each other with no gaps creating the perfect sphere you see here. I always find myself holding my breath as I gently place the last few roses in to complete the ball. 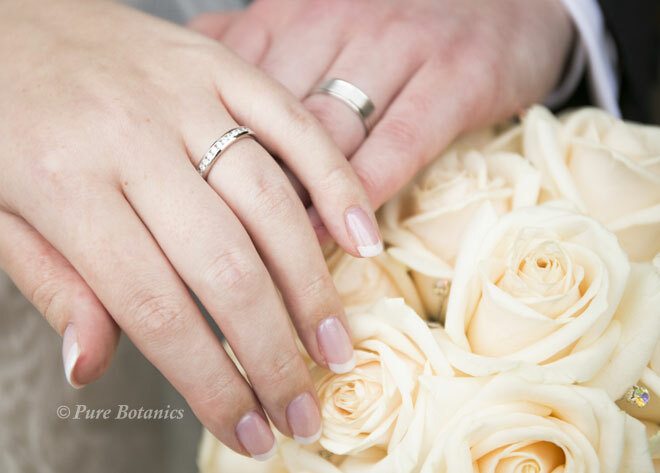 We are often asked to add elements of sparkle into the flowers when the bride has diamante details on her dress, shoes, hair accessories or just a love of sparkly things. To compliment the bridal bouquet Rebecca chose all rose handtied bouquets for her bridesmaids, keeping with the classic elegant look from the roses. 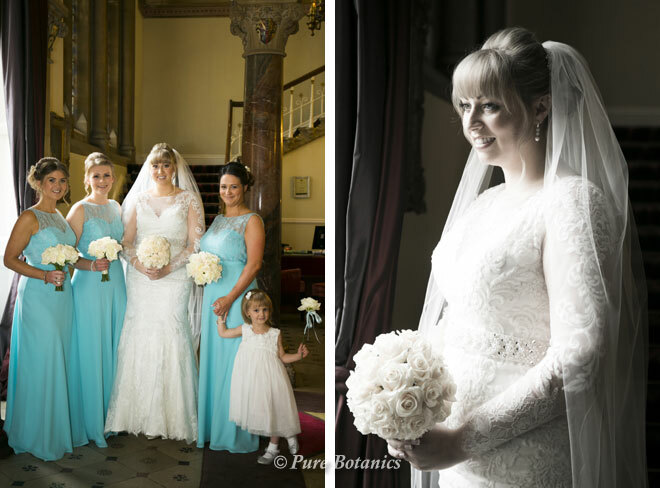 The ivory colour worked really well in front of the aqua blue bridesmaids’ dresses. Even the young flower girl held a rose wand and she looks like she’s really enjoying it in the photo seen here above. Rose wands are a great choice for young flower girls as they are often familiar with holding wands so it comes quite natural to hold them. The gents followed the theme with classic rose buttonholes backed with a small amount of ruscus and wire and diamante bead detailing. 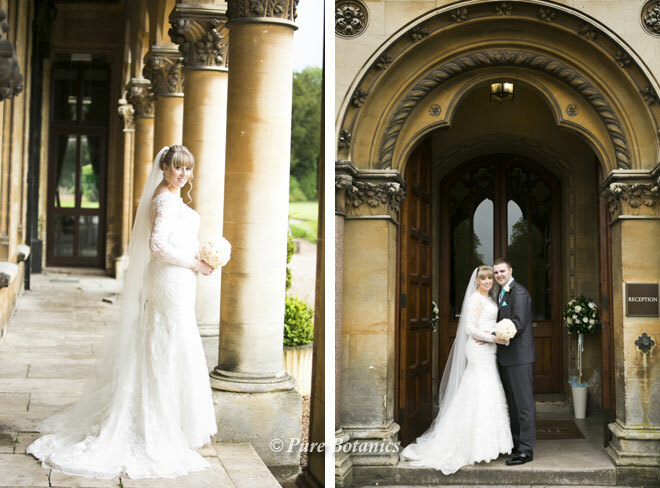 The wedding ceremony was held in St James Chapel, Walton that is literally a short walk across from the grounds of the hotel. It’s a chapel that we have decorated on numerous occasions. Here you can see one of the two large pedestal arrangements that sat either side of the altar. 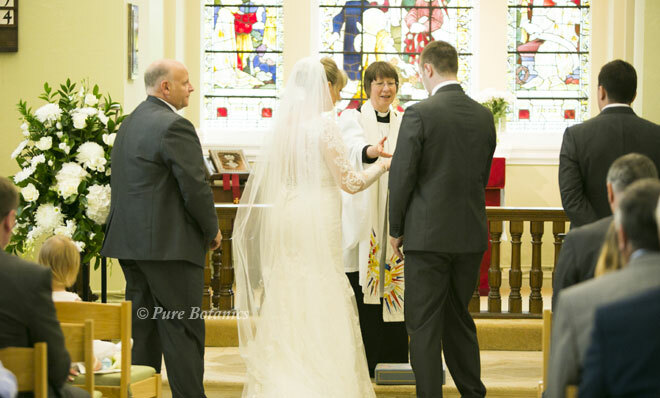 It’s a small church so pedestal arrangements work really well as they dress the area where the ceremony is taking place but don’t get in the way. 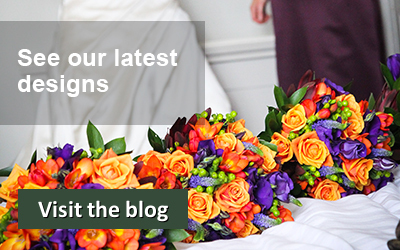 These featured beautiful white hydrangeas, lisianthus, chrysanthemum daisies and of course roses. 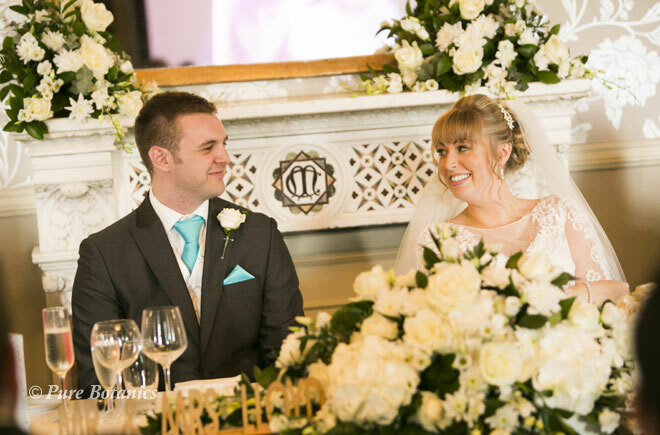 The wedding breakfast was held in the beautiful Moncreif room at Walton Hall with its ornate chandeliers and tall decorative ceilings. 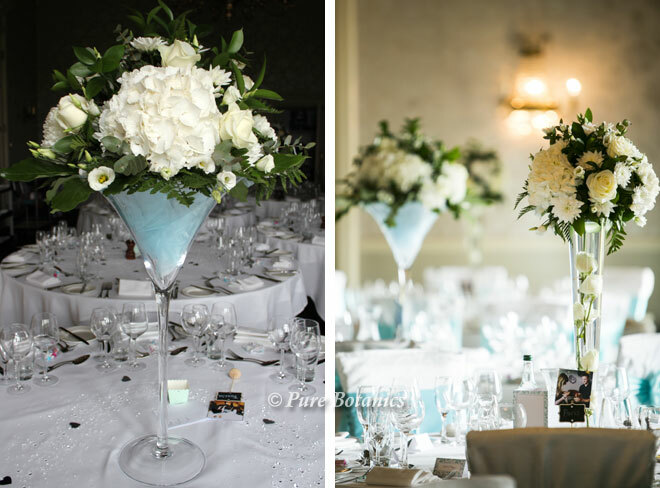 Rebecca chose two of our really popular tall table arrangements that you can see here: the tall cone vases and large martini vases both filled with the same flowers that we used in the chapel arrangements. The whole room looked fabulous when I finished setting up the tables. The ivory colour theme gave the room a really elegant look. I added just a hint of the aqua blue of the bridesmaids’ dresses by lining the large martini vases with the same colour organza. 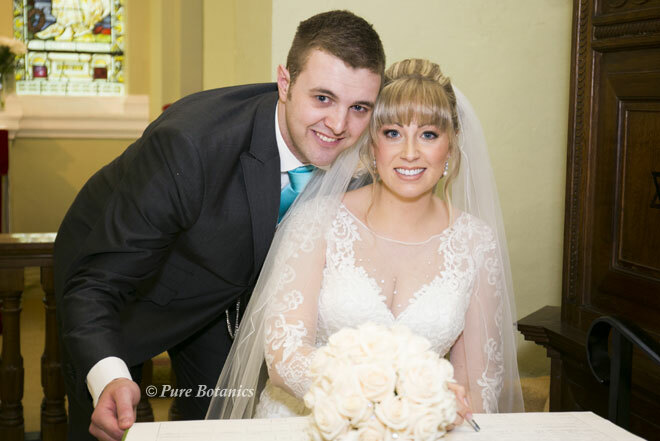 I thoroughly enjoyed working on Rebecca and Craig’s wedding and was so delighted when they send me these wonderful images. 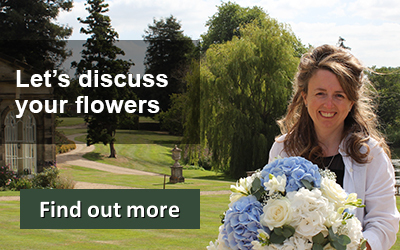 Here’s what they had to say about their wedding flowers.